I teach a couple of classes about birds for the Center for Lifelong Learning at Ivy Tech Community College. In the spring of 2019, I will be offering an Advanced Bird Identification class. This course will be held on four consecutive Thursday evenings starting on April 11th. Each session runs from 6:30-8:00 p.m. at the Waldron Arts Center in downtown Bloomington. Each week’s class will address a different bird identification method plus take an in depth look at a group of birds: birds of prey, shorebirds, warblers, and some tricky songbirds (think flycatchers and sparrows). Cost is $59. More details and registration info can be found here (please scroll down a bit) or in the Ivy Tech Center for Lifelong Learning course catalog. A new offering! I will come to your home and teach you about the birds that visit your yard. During the winter we can sit by your window and discuss bird identification and feeding tips. During spring or fall we can sit outside or go for a walk and learn to identify the birds by song and call. I will even bring Celestron binoculars and a spotting scope for your use. $100 for two hours, plus I’ll bring coffee and pastries! A great social activity for you and your friends! I often get requests to visit elementary schools as a guest speaker and am happy to do that if I’m available. I do charge $50 per visit. I begin with a short Powerpoint presentation showing photos of local birds and their characteristics (or adaptations) that help them thrive in their environment. Then I have the students participate in an hand-on activity where they decide which kind of common tool (representing bird beaks) would be best at eating different types of food. If requested, the visit can conclude with a short birding walk around the school grounds that focuses on the adaptations of the birds we find. An introduction to bird biology and the birds that call Indiana home. I will discuss the unifying characteristics that all birds share as well as their strategies for survival. The level of detail can be adjusted to a wide range of grade levels. Upon request, I will lead the class on a walk around the school grounds in search of the resident birds. I enjoy the opportunity to speak to community groups, social clubs, retirement homes, and other groups about the amazing birds that surround us here in south-central Indiana. These presentations can be adapted for talks 15-45 minutes in length and are usually free, though I may charge in some instances. Other presentations can be developed, in which case I usually request a $100 honorarium. In this talk, I present a picture of what Indiana looked like pre-settlement, how devastating humans have been, and what steps have been taken to restore the nature that surrounds us. I will highlight the stories of the bald eagle, the whooping crane, and some of the warblers that inhabit our mature forests. 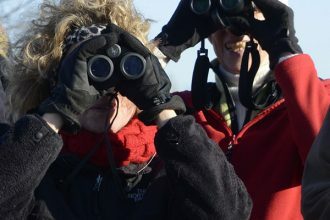 Goose Pond Fish and Wildlife Area in Greene County has quickly become one of the premier birding destinations in the Midwest, but it isn’t the easiest place to navigate for visiting birders. I will provide an overview of the preserve and its history, focusing on the species that again call it home. If you have an idea for another activity in mind, please contact me. I am always looking for new offerings that appeal to my guests.